hursday, the March 26, 2009, I along with my younger brother Ram Sarup and some of my colleagues enjoyed a picnic at Ujj Dam. Ujj Dam is at Rajbagh, in Kathua District, Jammu. Rajbagh is 62 Km. away from Kunjwani, Jammu. From Rajbagh (On National Highway) Ujj Dam is five kilometer away in the interior of Jasrotia village. Near the dam on the roadside there is a temple up in the forest. We did not take any notice of the temple and only had a passing look at it. Sunday the 29th. March 2009, on way to Bantalab, I spotted Shri Pran Nath Ji Mattu son of the late Shri Anand Joo Mattu of Zaindar Mohalla/Jawahir Nagar/Krishna Nagar, Jammu at New Plot. I asked my nephew Joginder to stop his car and carry Pran Ji along with. Pranji readily obliged us. He was on a mission to purchase mutton. Before Pranji would alight from the car at Janipore, I requested him to narrate the episode of his discovery that I had heard in early seventies in Srinagar from my elder brother Shri Girdhari Lal Ji. 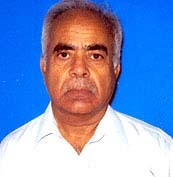 I quote Shri Pranji: “1962-63 I was posted as an engineer at Jammu Municipality. One day at Link Road, a horse rider trampled me. After a little while when I came to myself, I chased him in a taxi. Soon I realized that I had a miraculous escape without even a scratch. God has saved me. What then if I catch hold of him. I left the chase and thanked God. That night I had a dream. Dream: I was passing through an unknown village in Jammu. I reached some foothill, where a bamboo staircase was stretching upwards. Mr. Sharma, my work Mistry resident of Samba supported the staircase with his shoulder and asked me to go upstairs. I preferred the staircase to be held fast and not to be supported by his shoulder. I went upstairs and a plane plateau whereon there was an old temple. 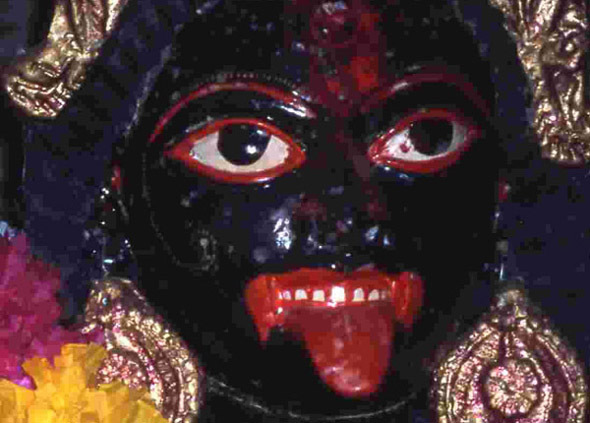 I entered into the temple and saw my grand mother (from mother’s side) in the form of Mata Kali. To her left I saw an idol of Hanuman. Mata directed me to perform a havan there in the temple. When I woke up, I narrated the dream to my parents. They took it seriously and asked me to do as directed. In pursuance I went to Shri Bulji a Guru Ji at Purshyar, Srinagar. Without narrating the dream, after some meditation he of his own told me that havan as directed must be performed. I repeated my query again after half an hour to ensure if the reply will be consistent. Solution was again the same. Now I took the dream seriously and pursued its accomplishment. To locate the village seen in the dream was a riddle to be solved. Back to Jammu, for their help, I narrated my dream to some of my colleagues including the work Mistry Sharma. I gave them full description and topography of the village. I along with the work Mistry Sharma visited a number of villages, but failed to identify the village. Sharma consulted a few Numberdar and a forest guard. Finally, after six month hectic efforts, one forest guard lead us to Rajbagh and then to the interior forest track. I recognized the path as if it was familiar to me. I thanked God. My six month’s labour seemed to have borne its fruit. Those days there was no road. We trekked almost three to four kilometers through bushes and fields. Finally reached the spot of the bamboo staircase. We called the Numberdar of the village. He told us that for centuries none had dared to tread that side. Instead of bamboo staircase, it was stairs of boulders. We went up the virgin path through bushes and reached the plateau. To my immense joy I reached my destination. By this time, it was already 3:30 PM. Pranji without any reservations accepted our request and obliged us with his company on the dining table. I expressed my regrets that though we had been to that place on 26th. yet we failed to visit the temple to get blessed. What a pity! 2nd April, Pran Ji reminded me while on Radio Jammu, the DC Kathua to promote pilgrimage tourism, described the kali Mandir discovered by one Kashmiri Pundit, Shri Muttu. 3rd. April I joined Pran Ji and boarded the super fast bus for Kathua. The bus fare is Rs.35 up to Rajbagh and Rs. 5 to the temple in an auto rickshaw. It was a well organized Kali Mela and Havan. People in thousands stood for hours together in a serpentine queue to have darshan. We were lucky to be amongst the earliest ‘yatris’. We had not to wait. Havan was already going on. Members of the managing committee around the havan Kund were performing the Havan. All paid due respect to Pran Ji and enlarged the circle to accommodate both of us. After purnea ahoti both of us were taken to a big hall through a back door to enjoy the ‘langar’. Today it is a well developed pilgrimage site. Electricity and twenty-four hour fresh water supply is provided with. Granite floored big and capacious halls and many small temples around the main Kali temple have crept up. It is said that Mahraja Jasrotia used to visit the Mata Kali every morning. Finally it was an abandoned place live with snakes and scorpios . *I was born to my parents late Pundit Madho Dass and Rajrani (Sanpekuj) at Zaindar Mohalla Srinagar, Kashmir. I am told that I was born on 19th.February 1939. I graduated degree final through S P College Srinagar, in the year 1960. Until 1961, I worked as a Government teacher partly at Zainakote and partly at Verinagh High School in 60-5-100 grade @ Rs.96/ pm. 1962, I joined as UDC at AG’s office and the salary was almost four times. Though lifetime dream had come true, but I resigned in August ‘63 to improve upon my academics. 1963-65, I again enjoyed the student life at Mathematics Department of J&K University, Naseem Bagh, Srinagar, Kashmir. 1965-66, I completed B.Ed through the Teachers’ Training College Srinagar. Free education was the main bait to be in the Educational Institutions. 1966, I joined Statistical Department and 1975, I bade goodbye to the Government job. March 1973 onwards I am associated with M Dass Public Schools to pursue my passion for teaching.